Next month SBS 2 will screen the second annual Asia-Pacific Broadcasting Union’s TV Song Festival (ABU’s), the nearest thing Asia has to Eurovision. 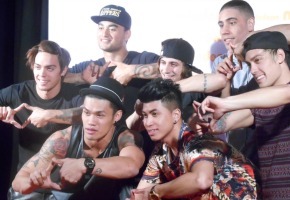 Australia will be represented by Justice Crew, while SBS PopAsia host Jamaica Dela Cruz will again be co-host. The first event was held last year in South Korea, and this year’s event takes place on October 26 in Hanoi. The event is not a competition so much as a showcase of regional pop music. Known as the Asia Pacific’s answer to Eurovision, the ABU’s are a celebration of culture and a showcase of the very best K-pop, J-pop, C-pop and everything in between, direct from this year’s host city Hanoi, Vietnam. SBS’s own Jamaica Dela Cruz, host of the SBS PopAsia Radio and TV shows, will be co-hosting the showcase for the second year running, bringing the kookiness, fun and non-stop pop the event is known for. ARIA Award nominated hip-hop group, Justice Crew will be flying the flag for Australia, performing their hit singles Boom Boom and Best Night. South Korean super group Sistar will be representing Korea, with other countries on the bill including Kyrgyzstan, Iran, Vietnam, Indonesia, China, Afghanistan and Brunei. Jamaica and the SBS PopAsia team will be bringing viewers all of the backstage action, straight from the streets of Hanoi, to the SBS Pop Asia TV Show, radio show, Twitter and Facebook page. Saturday November 9, 7pm on SBS 2. SISTAR are performing, that makes me a must watch for me.